When was the last time you had your building’s commercial fire alarm systems inspected? Even though we can expect frigid temperatures to continue, don’t think that means the winter is a time when fires are less prevalent just because there is less heat in the air. By ensuring everyone is safe from the effects of fire, smoke, and carbon monoxide, you can make your business a much safer place to work. When was the last time you had your building’s commercial fire alarm systems inspected? One primary reason to install fire alarm systems in your commercial building is to help protect the premises and everyone inside it from fires. 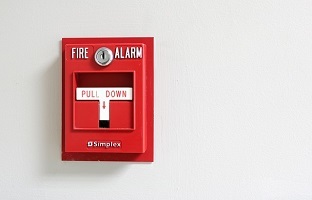 While it is fire protection systems such as fire extinguishers or water mist systems that actually contain or control the fires, the alarms can alert everyone that there is an emergency and that they need to leave the building and reassemble at a designated location a safe distance away from the building. Plus, these systems can automatically contact the authorities and bring first responders to where you are. You need to ensure that you are compliant with all fire codes in your area. That’s why you need to schedule regular inspections of your fire alarm systems. While you can do some simple testing, it’s much more effective if you have trained professionals conduct the inspections. They know what they’re looking for when it comes to verifying that everything is operating as it should. Two organizations, the National Fire Protection Association and Occupational Safety and Health Administration both have their own sets of standards and regulations regarding how often inspections need to happen and how they should be carried out. The only time that fire alarm systems are permitted to be non-functional is during installation or repair, and during these times, it’s prudent to arrange a fire watch or other similar method of detecting and responding to any fires that start. Preventing false alarms is also important. That’s yet another reason you need to have your commercial fire alarm systems inspected – to make sure that these problems don’t continue to crop up even after you have presumably addressed them. Preventing false alarms can keep related costs, such as the cost of fines and repairs, down – allowing you and your business to focus on serving customers instead of worrying about fire hazards. This entry was posted on Thursday, January 24th, 2019 at 9:15 am. Both comments and pings are currently closed.